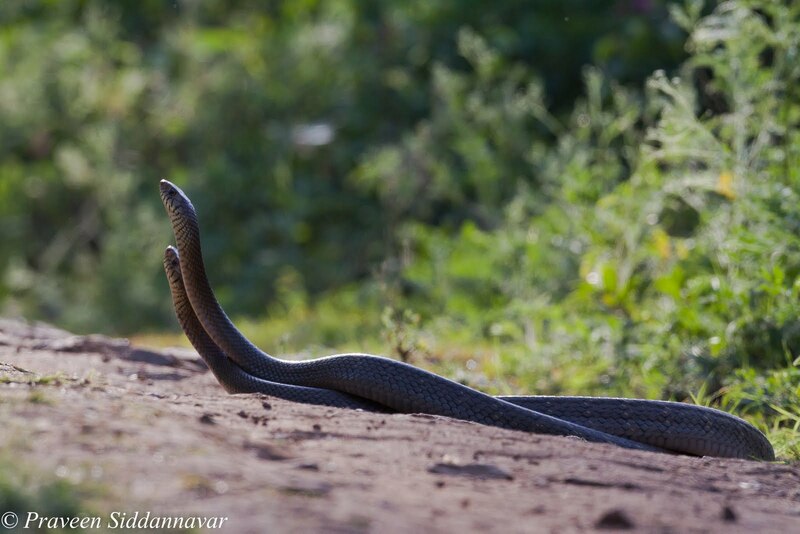 Praveen Siddannavar's Blog: Snake Rituals! 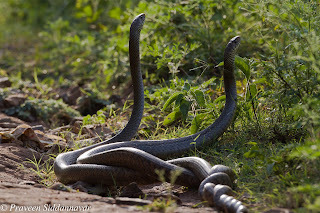 Have you seen or heard about Snakes Rituals? 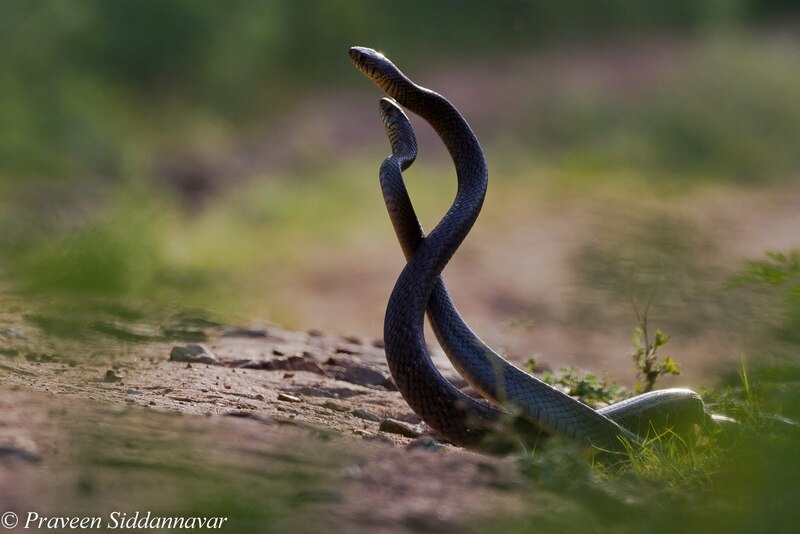 Snakes rituals are often mistaken by most of us for snake mating. 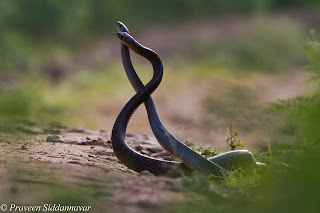 In this story I am sharing images clearly demonstrating Rat Snakes performing their rituals at the best. Please bear with the low quality of images as I had to shoot under tough conditions of light, especially shooting against light is one of the greatest challenges. The people of Karnataka call the rat snakes as Kere Havu, while in Marathi it is Dhaman, Kerala it is Chera, and Cherai in Tamil. I was put at Gorukana Resorot in BR Hills, We had just checked in our cottage when I received call from Jade Swamy, a Senior Naturalist. 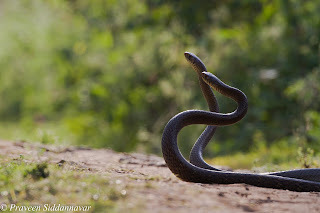 He mentioned to me that he spotted two snakes near the exit gate and mentioned that they were mating. I rushed to the spot with my camera. Snakes are exciting to watch and equally dangerous if disturbed. 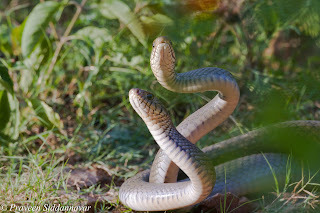 Fortunately these were rat snakes that are non venomous, but their bite can be nasty. The snakes were in the open; however my position to shoot wasn’t that great I had to shoot against direct sun light at about 5pm. I had to fall flat on the ground, use my bag pack as the support for my lens and shoot. This position is important from a photographer’s point of view to get the best low level angle. 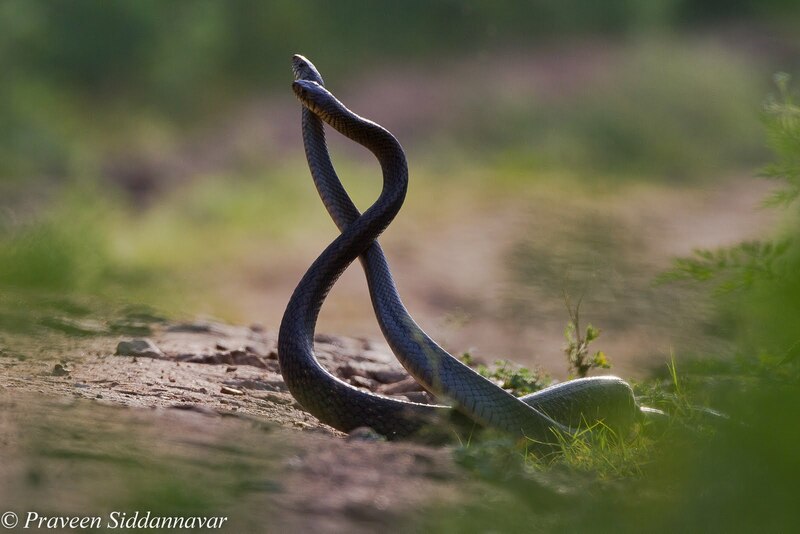 This snake ritual is nothing but a combat dance performed by males of the species. Though a friendly ritual with no over display of aggression, it is driven by instinct and used to define territory and defend mates. Its frequent and customary expression during the breeding season is proof of this encoded behavior. The ritual was fascinating to watch and this went on for good 30 mins, until few soliga forest tribals were passing by and the snakes got disturbed and moved into the bushes. 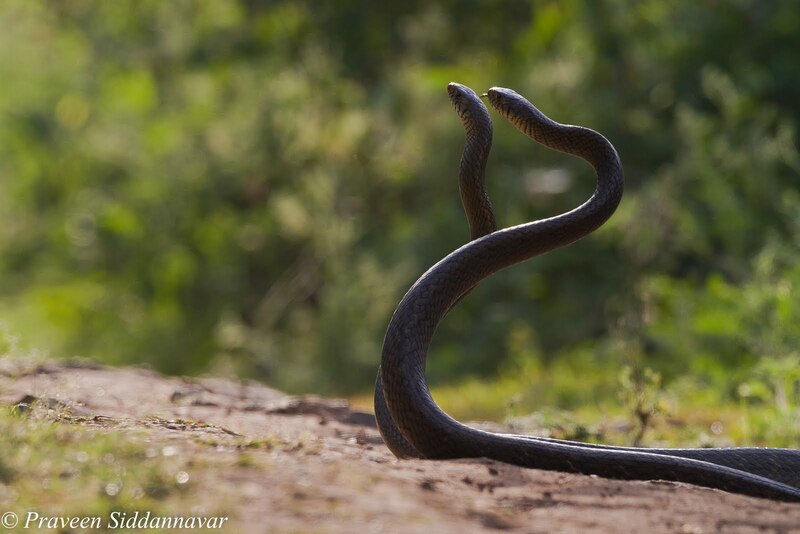 Another challenge to shoot the combat dance is the speed; the snakes stand tall and swirl swiftly with excellent synchronization of their movements. So getting the right focus becomes difficult. I always wanted to photograph snakes, especially my dream is to photograph the King Cobra, and I guess I am getting there sooner or later. The Rat snake is at times mistaken for a cobra and killed needlessly. It offers valuable service to the environment by keeping the balance of the ecosystem through its feeding on rats, frogs and insects in places where agriculture is the dominant activity. 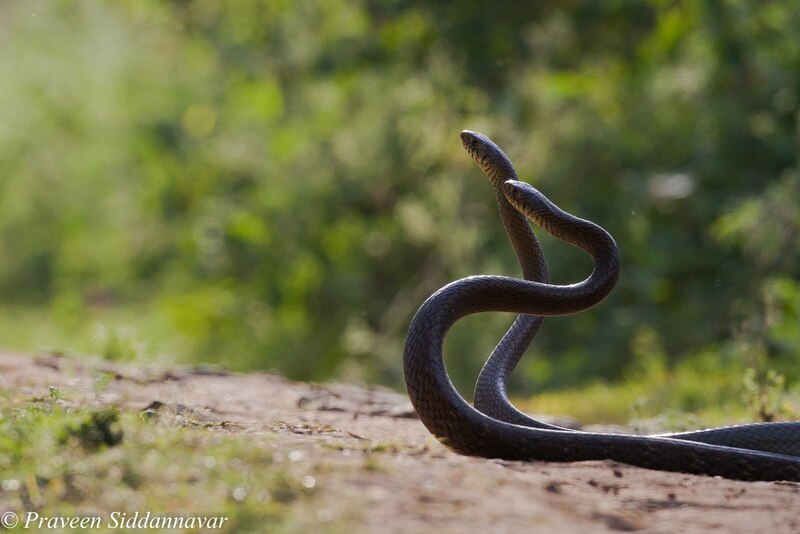 Though large and fierce looking, the rat snake is not a poisonous species. Beautiful pics buddy!! !The description,brought life to the pics!!! Very informative one. Pics tell 80% of the story.